The molding that is projected above the arch over a door or window. Also known as drip; label. 1. The outermost projecting molding around the top of a door or window, to discharge rainwater. 3. A pipe, or a steam trap and a pipe considered as a unit, which conducts condensation from the steam side of a piping system to the water or return side of the system. 4. 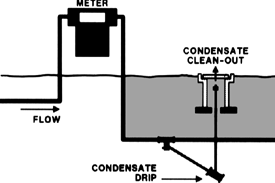 A container that is typically installed at a low point in a gas piping system to collect condensate (i.e., liquids that may form within the gas system). The projecting molding of the arch over a door or window, whether inside or outside; also called a dripstone.